Mostly clear. Low 36F. Winds S at 10 to 15 mph..
Mostly clear. Low 36F. Winds S at 10 to 15 mph. Jeff Kempka, owner of Salvage Signs, holds old wood made perfect by natural imperfections and branding practices in his Hamilton shop. Salvage Sign Owner Jeff Kempka focuses on the character of the wood and takes the details into consideration when creating sign designs. Salvage Signs creates custom signs for events, homes, cabins, ranches, bed-and-breakfasts and inns. 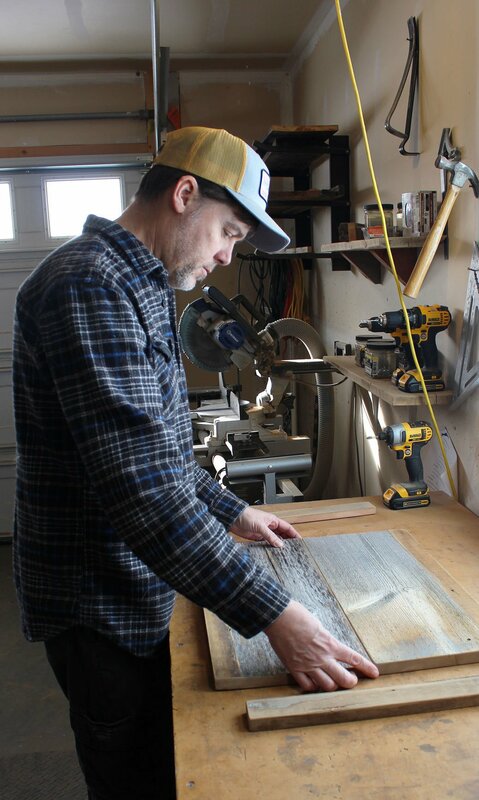 Salvage Signs, owned by Jeff and Heather Kempka, are works of art handcrafted from rustic old barn wood made to create the feel of history, Montana, Northern Rockies, iconic outdoor places and activities and ranching culture. Designs include historical signs, trail markers, National Park logos, ski runs and wildlife. The couple creates custom signs for homes, cabins, ranches, bed-and-breakfasts and inns. Each sign is hand-built and hand-painted in the Salvage Signs shop in Hamilton. The focus of Salvage Signs is on simplicity and nature. Heather Kempka started the business in 2012 as an outlet for her artistic abilities and love of nature. She started this business as a part-time job while attending nursing school, in 2011. Jeff joined part-time in 2012 and took the business on full time in 2014. Salvage Signs uses salvaged, reclaimed, Montana barnwood taken from ranches and buildings as a base then designs and hand-builds each sign in their shop in Hamilton. The wood is lightly sanded and the attention to detail includes rounding the corners and treating the edges with a special recipe to avoid the just-cut look. Gray is the most popular color for wood and white is the best paint for contrasting. The design is created, painted, hand-perfected, distressed then lightly waxed. Metal is a recent addition to production at Salvage Signs. Salvage Signs hopes to expand its custom artwork — whether it is making small changes to existing work or an original piece or creating an original piece using the client’s design ideas and business logos. The duo work closely with clients to select the right size, colors and wood choices to best suit the project. Salvage Signs products are sold on Etsy (www.salvagesigns.etsy.com with free shipping from now to Feb. 16) and at the Distinctly Montana Magazine’s online gift shop. Jeff Kempka ships the signs to retail partners in Whitefish at The Walking Man Gallery and Frame Shop; Electric Avenue Gifts in Bigfork; The Wine Cave and River Rising in Hamilton; Grizzly Claw Trading Company in Seely Lake; Montana Supply in Big Sky; Northwest Handmade Furniture and Gallery in Sand Point, Idaho; and Made in and Jackson Hole, Wyoming. The average sign price is $100 to $200 and the business is gift and tourism based with the big months being July and August then November and December. Salvage Signs received a $12,000 grant from the United States Department of Agriculture (USDA) working through the Small Business Development Center (SBDC) in Missoula. The grant money was used for branding and website development. Salvage Signs is applying for another grant for marketing. The Kempkas said they hope that Salvage Signs bring a sense of history, outdoors and inspiration. For more information visit the Salvage Signs website: salvagesignsmt.com; purchase on Etsy - www.salvagesigns.etsy.com or view the up-to-date signs and custom items on Instragram #salvagesigns.